WW1 Reenactments Equipment : Great War Tommy WW1 Documents, Paperwork : Church Army Headed Notepaper. 1914. WW1 Reproductions and WW1 Reenactors Equipment / Kit - Church Army Headed Notepaper. 1914. 'Church Army' Headed Notepaper. 1914. 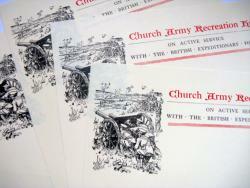 'Church Army Recreation Hut' (similar to YMCA) headed notepaper, circa 1914-1915. "On Active Service with the British Expeditionary Force" Bold red and black text on cream paper. Features drawing of Field Gun battery in action! Pack of 10.